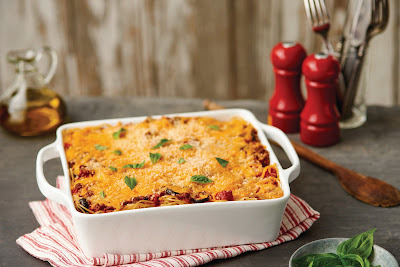 When the temperature drops, there's nothing quite like the pleasure of simple and delicious comfort food. Instead of letting the winter chill get you down, warm your body and heart with dishes that are both comforting and delicious. After all, there is no better time to satisfy your cravings for feel-good favorites than during the cold winter months. These mouthwatering winter recipes will not only help warm you up, but create a loving family dining experience that everyone can enjoy. When serving up hearty winter recipes, such as a savory Pulled Pork Grilled Cheese or delectable Baked Spaghetti, there's no better way to satisfy the craving for wholesome comfort food than with Borden Cheese and its wide range of offerings. From mild cheddar and mozzarella to Mexican, Swiss, American and more, every chunk, slice and shred is pure, creamy goodness that transforms family recipes into something truly memorable. Spray 9-by-13-inch baking dish with nonstick spray. Cook spaghetti according to package directions. In large, nonstick skillet, heat butter over medium-high heat until hot. Saute onion and pepper until tender. Add ground beef and cook until beef has browned; drain. Stir in tomatoes, mushrooms, olives and oregano. Bring to boil and reduce heat to medium. Simmer 10 minutes. Place half of spaghetti in prepared baking dish. Top with half of vegetable-meat mixture. Sprinkle with half of cheddar cheese. Repeat layers. Combine soup with water; pour over casserole. Sprinkle with Parmesan cheese. Bake uncovered 30-35 minutes, or until thoroughly heated. In small, nonstick skillet, heat olive oil over medium-high heat until hot. Stir in onions. Cook, stirring frequently, until onions become tender and golden brown. Spread mustard on one half of tortilla. 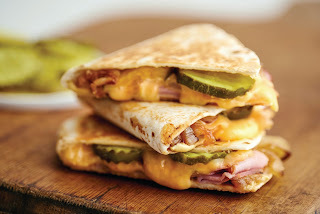 Top with ham, onions, pickles and cheese; fold uncovered part of tortilla over filling to form semi-circle. Cook quesadilla in dry skillet over medium-high heat until browned on both sides and cheese is melted. To make sandwiches: Heat smoker to 210 F.
Smoke pork shoulder 3-5 hours, until internal temperature reaches 150 F. Remove and wrap in aluminum foil. Refrigerate overnight. Remove excess fat from pork. Using two forks, shred remaining meat into large bowl. Mix in Barbecue Sauce. In skillet or griddle, brown two slices of buttered sourdough bread over medium heat. Place slice of cheese on each piece of bread. 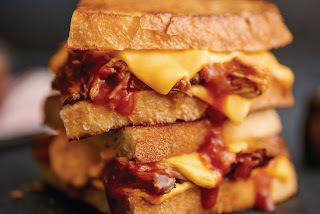 Top with one-eighth of pulled pork mixture, second slice of cheese and another slice of buttered bread. Turn sandwich over when bottom slice has browned and brown other side. Tip: Use prepared pork shoulder in place of smoking pork. To make Barbecue Sauce: In medium skillet, melt butter over medium heat. Saute onions until soft; stir in jalapenos, ketchup, sugar and liquid smoke. Bring to boil then reduce heat to medium-low and simmer 1 hour, or until sauce has thickened to desired consistency. Tips: To make sweeter sauce, add more sugar. To make spicier, add more jalapenos. Heat oven to 350 F and spray 8-by-8-inch baking dish with nonstick spray. In medium skillet, heat oil over medium heat until hot. Add onion and garlic, and saute 1 minute, or until onion is tender. Add quinoa and cook, stirring, until golden brown and toasted, 2-3 minutes. Add water, bring to boil, reduce heat to medium-low and simmer, covered, until water has been absorbed, about 10 minutes. Remove from heat. In large bowl, whisk together eggs and milk. 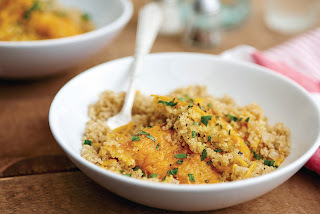 Stir quinoa into egg mixture and whisk in 1/2 cup cheese. Spread in prepared baking dish and sprinkle with remaining cheese. Garnish with chopped tomato and green onion, if desired. Serve immediately.